Zoanthids are an incredible beginners coral, the Button Polyps are easy to care for and make a bright, colorful display in the reef aquarium! 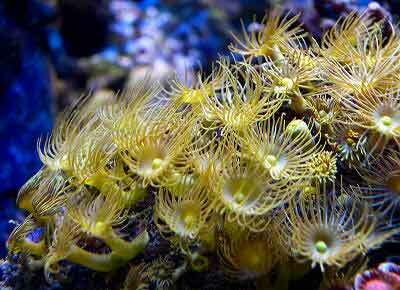 Colonial Yellow Polyps are quite common and readily available for a reef aquarium! The Parazoanthus species are very common in the aquarium trade, but there is quite a variety within this genus. They are found in the both the Atlantic and Pacific Oceans, and from both tropical and temperate waters. Some can be found living on rock or other hard substrates, and many grow on hydroids, gorgonians, or sponges. Typically the sponge, or whatever life form a Parazoanthus has attached itself to, will need to be kept healthy or the polyps themselves may die. The Colonial Yellow Polyps Parazoanthus axinellae, also known as Yellow Encrusting Sea Anemone or simply just Yellow Polyps, are from the Mediterranean and Atlantic Ocean, and possibly from the Pacific. Most of the Parazoanthus sp. are not yet classified, or they are mis-identified. The taxonomy of the Zoanthids itself has been very difficult. Although some species are described, it is still largely speculative. The Parazoanthus corals are mostly not identified to the species level, especially those from the Pacific. Rather they will often be described by such things as their number of tentacles or their host organism, but also by their color. The Colonial Yellow Polyps P. axinellae is one species that has been described, and as they sometimes encrust Axinella Antler Sponges, that is reflected in its scientific name. However many of the Parazoanthus species that sport a yellow, golden or orange coloration have not yet been described, and most are just simply called Yellow Polyps. Yellow Polyps can be moderate to hard to care for. Most of the Parazoanthus corals do not contain the marine algae, zooxanthellae, so the need to take in food is very important to their survival. They generally need a medium current and moderate light. Though most may not need light for zooxanthellae to grow, all species need to be fed zooplankton type foods and will usually feed readily. The Colonial Yellow Polyps P. axinellae encrusts rock or various types of dead matter, like old worm tubes. However for some Parazoanthus species, their survival may depend on the survival of their host organism. For those with a host sponge, the sponge does need to be in a high water flow area. It can be put in a dimmer part of the tank to avoid cyanobacteria from forming. The Parazoanthus corals are not an aggressive species, but they can grow over skeletons of corals or gorgonians. If the sponge can encroach on other corals, the polyps will follow. Filamentous algae can be a problem, as it can smother them. As with most zoanthids, mushroom anemones should not be placed nearby. Distribution / Background Parazoanthus Coral Information: The Parazoanthus genus was described by Haddon and Shackleton in 1899. Species found in the Atlantic include P. axinellae, P. catenularis, P. parasiticus, P. puertoricense, P. swiftii, and P. tunicans; species found in the Pacific include P. dichroicus. The common Yellow Polyps often referred to as P. gracilis also come from the Pacific, however these have not yet been scientifically identified to the species level, or even to the genus level. So this is not a valid scientific name or classification for these zoanthids. The Colonial Yellow Polyps Parazoanthus axinellae was described by Schmidt in 1862. Other common names this species is known for are Yellow Encrusting Anemone, Yellow Encrusting Sea Anemone, and Yellow Polyps. Where Parazoanthus Corals Are Found: The Parazoanthus genus are common in both the Atlantic and Pacific Oceans. P. axinellae are found in the Mediterranean and in the temperate zones of the eastern Atlantic; and possibly Pacific species. Parazoanthus Coral Habitat: The Parazoanthus genus inhabits numerous locations throughout the reef. They will encrust rocks or various types of dead matter, like old worm tubes; or many will grow on living organisms like hydroids, gorgonians, or sponges. The prefix "Para" is often associated with a parasitic situation where the host views its newly found friend as a pest. In this case, though, Parazoanthus are not presumed to be parasitic to their hosts as both are believed to benefit from each other's company. The Parazoanthus sp. do not live in areas where the light is intense, and like their hosts, this is not as important as needing to feed from the water column. Most prefer a moderate current and medium light. The Colonial Yellow Polyps P. axinellae encrusts rock and old worm tubes, or other types of dead matter. Sometimes they will colonize the Antler Sponges from the Axinella genus. Status The Parazoanthus genus is not on the IUCN Red List for Endangered Species. Description What do Parazoanthus Corals look like: The Parazoanthus genus usually form small colonies and reproduce asexually by budding daughter polyps from their base. They can be solitary polyps or connected through a mat, called the coenenchyma. If a mat is present it is usually membranous, but unlike many other Zoanthids, their mat doesn't have sand or sediment incorporated into it. Most of the Parazoanthus corals do not contain the marine algae, zooxanthellae, so the need to take in food from the water column is very important to their survival. They also produce a strong compound that is toxic to many fish. The Parazoanthus corals have soft bodies covered with a leathery skin, called the cuticle, which gives them protection. The bodies are usually fluted and they have long, thin tentacles. Their colors can be yellow, golden, orange, yellow-brown, or green-brown, and with some being dark red or wine colored. Their color will often contrasts with the color of their host organism, most likely to prevent predation. This Zoanthid is an Atlantic species and it is also referred to as a "yellow polyp". It is found on encrusting rock, old worm tubes and other surfaces. It has a fluted shape and the colonies consist of polyps that are not touching at the base. Though it will sometimes encrust the Antler Sponges from the Axinella genus, It does not need a host to survive. They need moderate light and moderate water movement. This is also an Atlantic species that has brown to yellowish brown polyps with 20 tentacles. This Zoanthid is an Atlantic species that is greenish brown or brown to yellow with a white body column that is encrusted with sand and it has 28 tentacles. They are found on red boring sponges, tube sponges, or loggerhead sponges in small groupings. This too is an Atlantic species that are dark red to white and at times clear. They grow on volcano sponges, tube sponges and Pipes of Pan. Another Atlantic species that are bright orange, gold or yellow and are found on sponges. They grow in a spiral formation across finger sponges, rope sponges and tube sponges. Another Atlantic species that are orange, brown green or pale yellow with sand-encrusted columns and grows on hydroids from the Plumularia genus. The common Yellow Polyps often referred to as P. gracilis also come from the Pacific, however these have not yet been scientifically identified to the species level, or even to the genus level. So this is not a valid scientific name or classification for these zoanthids. These polyps are found in the tropical Western Pacific Ocean on rocks and other surfaces where there is moderate light and water movements. They catch zooplankton and uses light for survival. This Zoanthid is a Pacific species that are small with sediment encrusted polyps. These polyps are beige with orange or yellow tentacles. These grow on hydroids. This is another Zoanthid from the Pacific that looks very much like P. axinellae. At times it is mislabeled as P. gracilis. It would be assumed to have similar lighting and water movement needs. Difficulty of Care Parazoanthus Coral Care: The Parazoanthus genus can be moderate to hard to care for. Most of the Parazoanthus corals do not contain the marine algae, zooxanthellae, so the need to take in food is very important to their survival. They generally need a medium current and moderate light. Though most may not need light for zooxanthellae to grow, all species need to be fed zooplankton type foods and will usually feed readily. They make a fine aquarium coral, but with some caution. Parazoanthus produce palytoxin, one of the most potent poisons known to science. For this reason one should take care when handling them. Don't handle them if you have cuts or open wounds and make sure to clean your hands after handling. The members of the Zoanthidae family have varying degrees of poison called palytoxin. All of the Palythoa genus and most Protopalythoa genus produce a high level of this poison in their mucus and gonads. Other genera, such as the Zoanthus genus, have it to a lesser extent, and so a less dangerous degree. To be affected by this toxin, it must either be ingested or must enter the bloodstream. It can enter the system through an open wound. It has been suggested by some that it may also be absorbed through skin contact though this is not confirmed. The danger to the aquarist is minimal with proper precautions. If you have a cut on your hand, this poison can get into your system, but in average aquarium keeping it is unlikely to pose any danger beyond a localized skin reaction. Some hobbyists wear gloves when handling these organisms. Here's a couple interesting facts! Fish that eat Paly polyps, like the filefish, can bring this palytoxin in to the human food chain. This would be when a predator of the filefish is a fish that is typically eaten by humans. Also, Pacific tribes used to use this neuromuscular poison to paralyze enemies and prey animals by coating their spears with the mucus of these corals. Vibrio can at times be in the coral mucus, thus causing a Vibrio infection in humans if care is not taken. Most people have no problem, but caution and common sense play a role here. Wearing gloves and possibly goggles may be the safe route to go. After handling a Zoanthid, make sure the mucus is not on your glove or hand before handling any other corals! Foods / Feeding Parazoanthus Coral Feeding: In the wild, Parazoanthus zoanthids have developed several feeding strategies. They capture planktonic organisms and microscopic food particles from the water column, and can absorb dissolved organic matter. Unlike other zoanthids, most of the Parazoanthus sp. do not contain the marine algae, zooxanthellae, so the need to take in food from the water column is very important to their survival. In captivity the Colonial Yellow Polyps do not need light, since they have no zooxanthellae. But in general the Parazoanthus sp. do need to be fed zooplankton to survive. Some species also do well with crustacean and fish flesh that has been minced, along with worms that are all small enough for them to grab. Polyps such as the common Yellow Polyps may not need supplemental feeding if they are in a good water flow area that whisks by food you have put in for the fish, enabling the polyps to capture their meals. Aquarium Care Stable tank conditions are needed to keep the Parazoanthus genus. Doing water changes of 20% a month or 10% biweekly is needed, although it is suggested that doing 5% water changes once a week will replenish many of the needed additives. Make sure iodine is present, and also the addition of trace elements may help with the Colonial Yellow Polyps survival. Magnesium: 1250 - 1300 ppm. A typical live rock/reef environment is what is needed for your Colonial Yellow Polyps, along with some fish for organic matter production. A mature tank (well over a year old) is advised to increase the successful keeping of Parazoanthus. The P. axinellae is from temperate waters and needs cooler aquarium temperatures, so a chiller may be needed. Provide proper lighting and water movement. Moderate water flow and a medium light source are required for Colonial Yellow Polyps to do well. These zoanthids are not an aggressive species. They get along well with their own kind, but space should be provided between them and other corals as they can overtake close neighbors. Marine Lighting: Medium for most species. Most can be put in a dimmer part of the tank to avoid cyanobacteria from forming. Water Movement: Moderate to high. For some Parazoanthus species, their survival may depend on the survival of their host organism. For those with a host sponge, the sponge does need to be in a high water flow area. Compatibility and Social Behaviors The Parazoanthus genus will get along with itself, but does need to be placed in an area where they will not encroach on nearby corals. They can grow over skeletons of corals or gorgonians. If the sponge can encroach on other corals, the polyps will follow. Colonial Yellow Polyps are not an aggressive species. They can be kept in the company of small peaceful coral reef fish and peaceful crustaceans. Other good tank mates include herbivorous blennies that will feed on filamentous algae. Avoid large crustaceans, large angelfish, and most butterflyfish. Sea Anemones and Tube Anemones should also be avoided. Breeding and Reproduction The Parazoanthus genus reproduce by forming and budding off new polyps from the base of the parent. Propagation of Parazoanthus corals includes making sure you have enough of the host (sponge, etc.) to ensure its survival as well as the Parazoanthus. If the Parazoanthus is connected to just a rock, then chances are it will be fine on its own. They can be out of the water a few minutes with no ill effects. Dry the bottom of the piece and the rock or plug you will be putting it on. Then use super glue (the gel is the best) to connect them. Wait a few seconds for it to set and then put it back into the water. Potential Problems The Parazoanthus genus is generally hardy and durable if provided with a proper reef environment. However be cautious of filamentous algae as it will overgrown and smother polyps. A snail called the Box Snail or Sundial Snail Heliacus areola preys on Zoanthid colonies, so must be removed if seen. Avoid large crustaceans and aufwachs feeders, such as large angelfish and most butterflyfish, that like to nibble on their tentacles. Availability Parazoanthus Corals for Sale: The Parazoanthus sp. are easy to find at pet shops and on line for species attached to rock, while Parazoanthus with a sponge host are more difficult to find. Online they can run about $16.00 USD or more, depending on the color and size.